Isiah Brown initiates the offense. The sophomore guard provided a spark off the bench Monday. Coming off a crushing comeback loss just two days ago, Northwestern decided one deflating second half effort wasn’t enough, blowing an 11-point lead in the second frame in a 71-64 home loss to Maryland on Monday. Senior guard Bryant McIntosh missed his second straight game with a shoulder injury, and once again in the second half, the Wildcats’ offense collapsed into a morass of bricked 3-pointers, offensive fouls and aimless possessions. NU (15-14, 6-10 Big Ten) scored only 27 points in the second half. Senior guard Scottie Lindsey led the overall scoring effort for the hosts with 15 points in the game. A 3-pointer from junior forward Vic Law put the Cats up 42-31 with 19 minutes remaining, but the Terrapins (19-11, 8-9) outscored them by 18 points from that point forward, ripping off a crucial 16-2 run down the stretch to take a 9-point lead. They never looked back. Maryland was led on the scoreboard by forward Kevin Huerter, who had a game-high 18 points. Huerter also led all scorers with 22 when the teams met two weeks ago at Maryland. 1. The new-look Cats struggled to communicate in the zone. 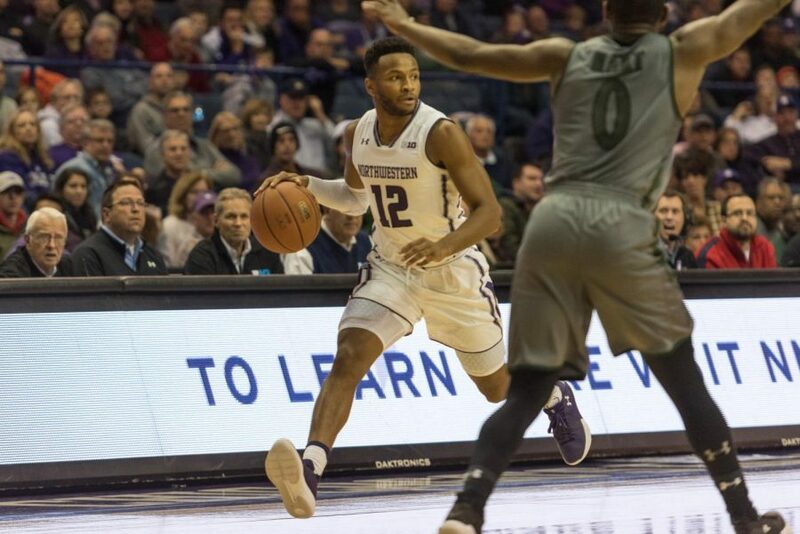 With McIntosh and junior guard Jordan Ash both recently removed from the lineup, NU struggled to communicate and lock down the Terrapins on the defensive end early in the game. While playing almost exclusively in a matchup zone, the Cats allowed Maryland to shoot 7-for-13 from the field and gave up three wide open putback dunks to Maryland forward Michal Cekovsky. The visitors raced out to an early 17-10 lead. 2. So coach Chris Collins changed the defense (again). NU hadn’t used a man-to-man defense as its base set since losing by 15 at Penn State in early January, but with the Cats struggling to contain the Terrapins early, Collins decided to mix things up and ditch the zone. Maryland proceeded to shoot 3-for-9 the rest of the half while committing six turnovers over that span. The Terrapins made their own adjustments at halftime, however, and shot 56 percent in the second period. 3. Northwestern postseason hopes aren’t looking good. Forget the NCAA Tournament — after this second-straight collapse, the Cats would be lucky to make the NIT. Currently sitting at ninth in the Big Ten, even wins over Wisconsin and Iowa to close the regular season would likely leave NU short the second-rate tournament. The easy comparison to be made is the 2015-16 Northwestern team, which finished 8-10 in conference play, had zero notable nonconference wins and lost in the first round of the Big Ten Tournament. The year’s resume would be looking quite similar, and that’s assuming the Cats win their final two regular season games.